I admit that the thought of hot hummus and cooked avocado is more than a bit off-putting, but you’re just going to have to trust me that they totally work here. Indeed, this sandwich– this panino if you must– is delectable, and is perfect comfort food as we transition into busy, blustery autumn. *I cooked this on a stovetop grill pan with a panini press, both preheated. In the past I’ve made it in a George Foreman grill. If all you have is a regular frying pan, that’s fine, too. Just cook the sandwich for a couple minutes on each side and use a spatula to press it down. Preheat your grill/griddle/panini press/pan over medium heat. Assemble your sandwich. 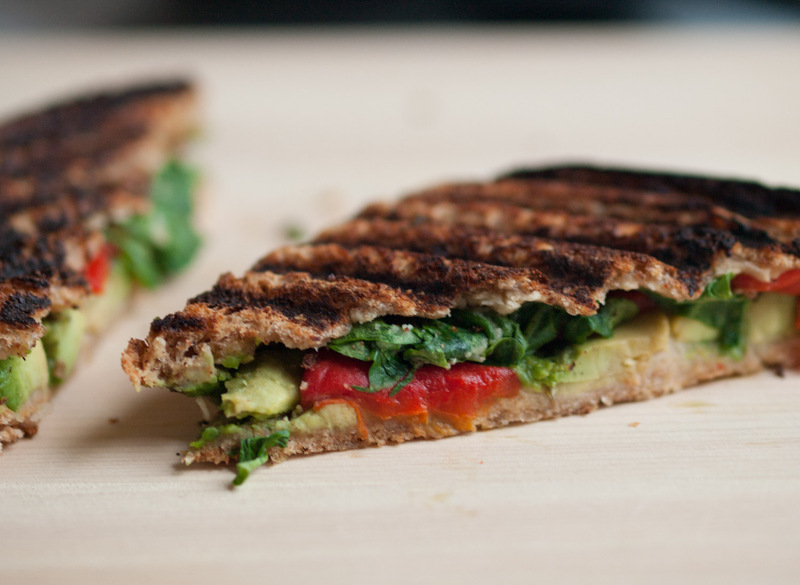 Spread hummus on each slice of bread, then add avocado, roasted red pepper, and arugula. Close sandwich and brush each side with a little olive oil. Cook for a few minutes, flipping if necessary, until bread is golden and maybe slightly charred and fillings are hot. This entry was posted in Mains and tagged Vegan MoFo on September 10, 2014 by Sarah. This is less a recipe and more a friendly PSA to remind you that peaches are still in season. 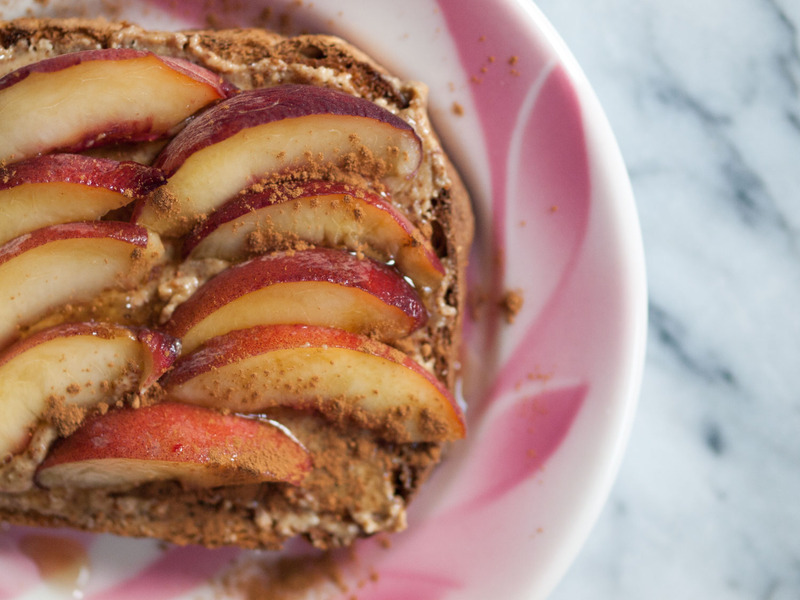 Spread almond butter on toast and sprinkle with pinch of flaky salt. Top with peaches, maple syrup, and a dusting of cinnamon. This entry was posted in Breakfast/Brunch and tagged Vegan MoFo on September 9, 2014 by Sarah. 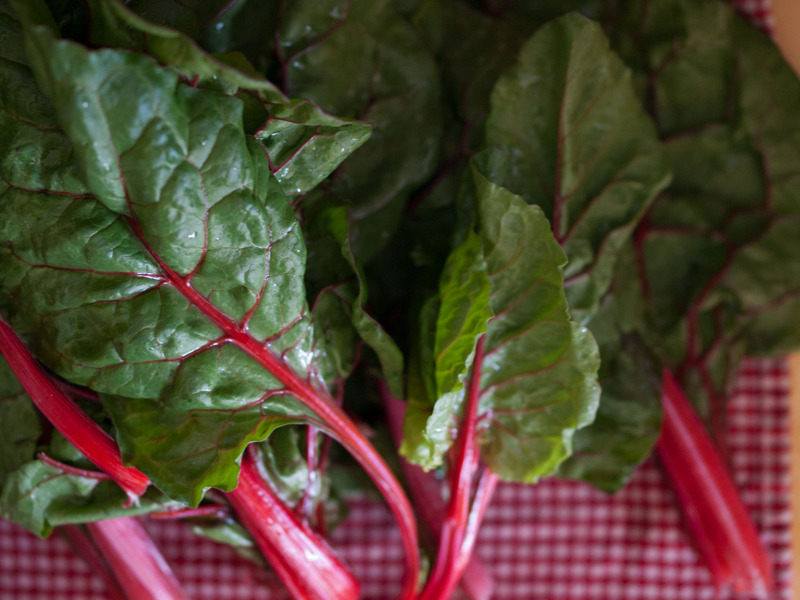 This is one of my favorite ways to enjoy beautiful, nutrient-rich swiss chard. Pine nuts are certainly not cheap, but are– at least to me– a worthwhile indulgence. However, chopped toasted walnuts would also be tasty. *Because the stalks of the chard are tougher than the leaves, they need a longer cooking time. First cut off and discard the very ends of the stalks. Then cut the stalks from the leaves, and chop into 1” pieces. In a separate pile, chop the leaves. Meanwhile, drizzle some olive oil into a large pan and cook garlic over medium low heat for a few minutes, watching closely and agitating frequently, until fragrant. Stir in chard stalk pieces and sauté for about 30 seconds, then add ¼ cup of broth, cover pan with lid, and cook over medium high heat for about 3 minutes, stirring occasionally. Add chard leaves, red pepper flakes (if using), and the rest of the broth. Cook, covered, for 4 to 5 minutes more, stirring every now and then, until cooked through. 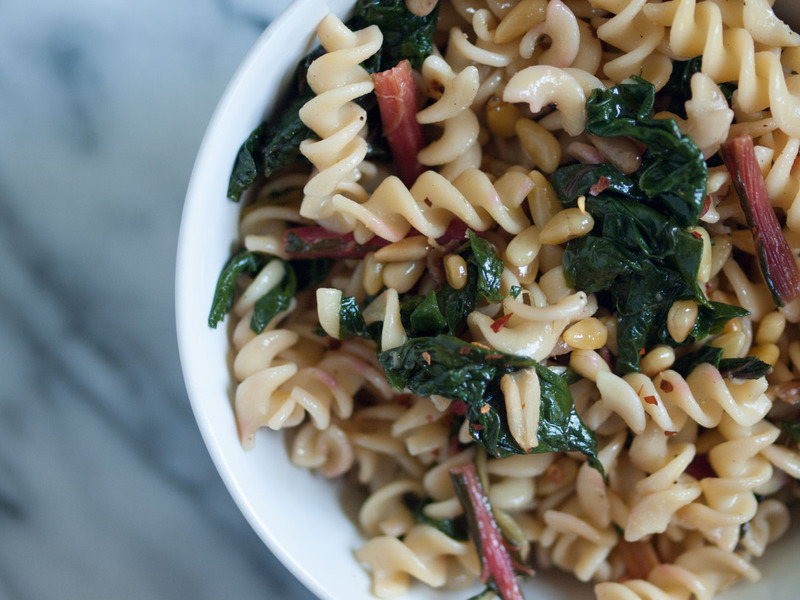 Mix drained pasta with chard, season with salt and pepper, drizzle with a tiny bit of olive oil, and sprinkle on the pine nuts. 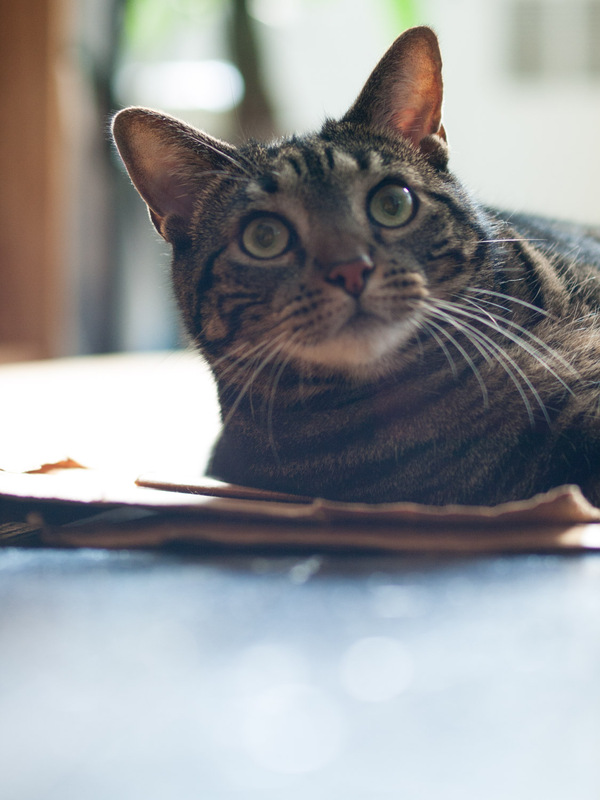 This entry was posted in Mains and tagged Vegan MoFo on September 7, 2014 by Sarah. 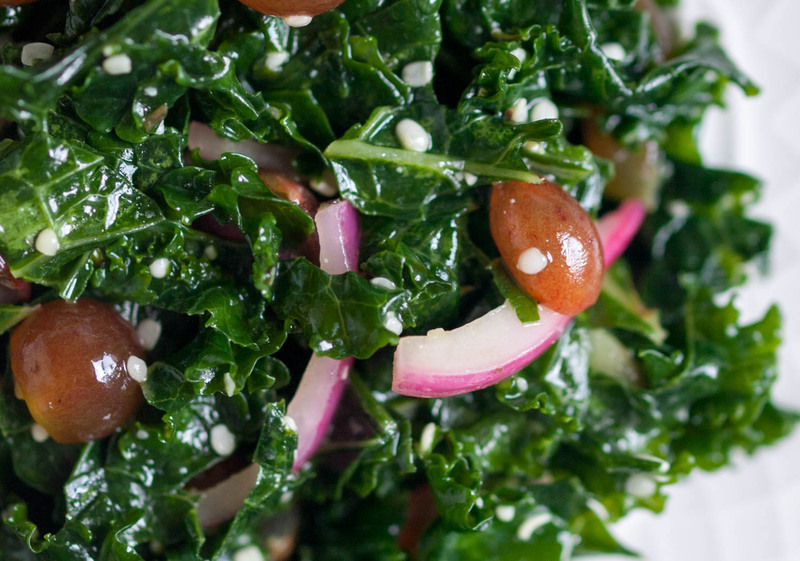 Kale salad is usually not my thing. 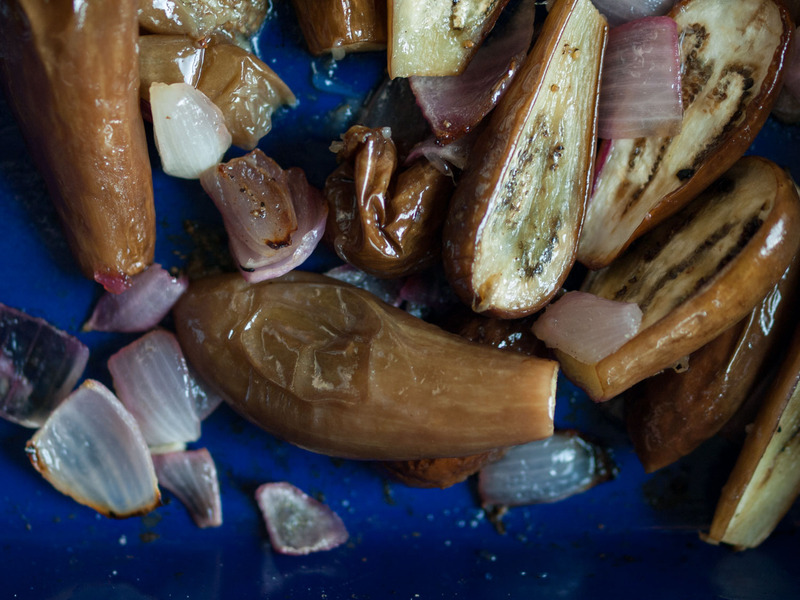 If you read my blog regularly then you know that I’m more of a braised greens kind of girl. And, yeah, I roll my eyes too when I see “massage” next to anything intended for consumption. Still, getting your hands in there and really working those leaves gives you tender kale that’s ready to absorb all sorts of tastiness (instead of just being a workout for your jaw). Early autumn red grapes add flavor and juiciness; adjust the amount of agave depending on how sweet or tart they are. 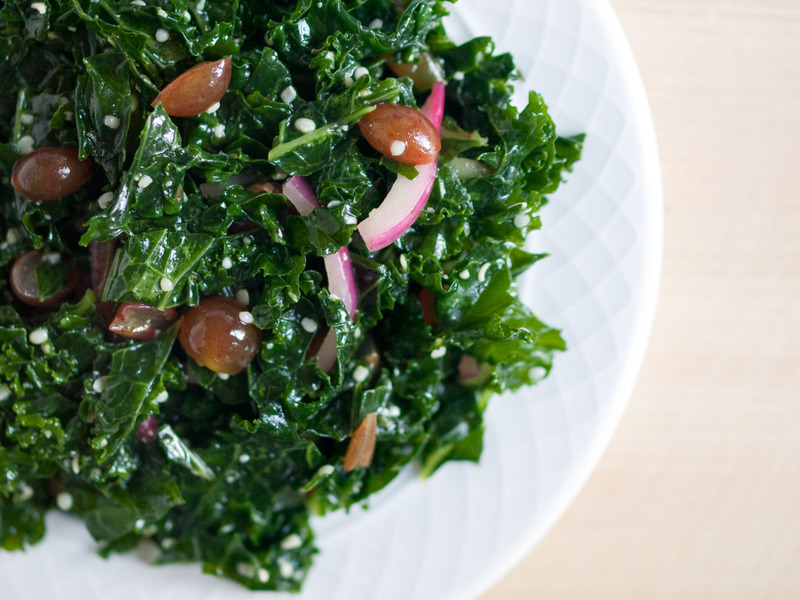 In a large bowl, drizzle olive oil and sprinkle some salt on the kale. Using your hands, massage kale for 2 to 3 minutes. 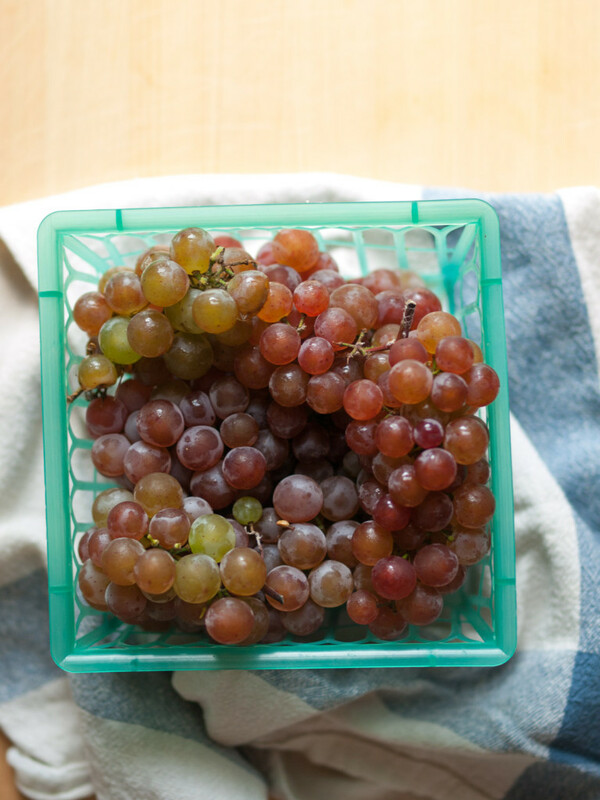 Stir in grapes, pickled onion, white wine vinegar, agave, and hemp seeds. Season with salt, black pepper, and red pepper flakes. Let sit for awhile for best flavor. This entry was posted in Salads and tagged gluten-free, Vegan MoFo on September 4, 2014 by Sarah. Can you tell I’m holding onto summer for dear life? Get these beauties while you still can, and enjoy in this simple yet delicious dish. It’s good both warm and cooled down. Add chickpeas and quinoa to make it a full meal. Preheat oven to 400°F. 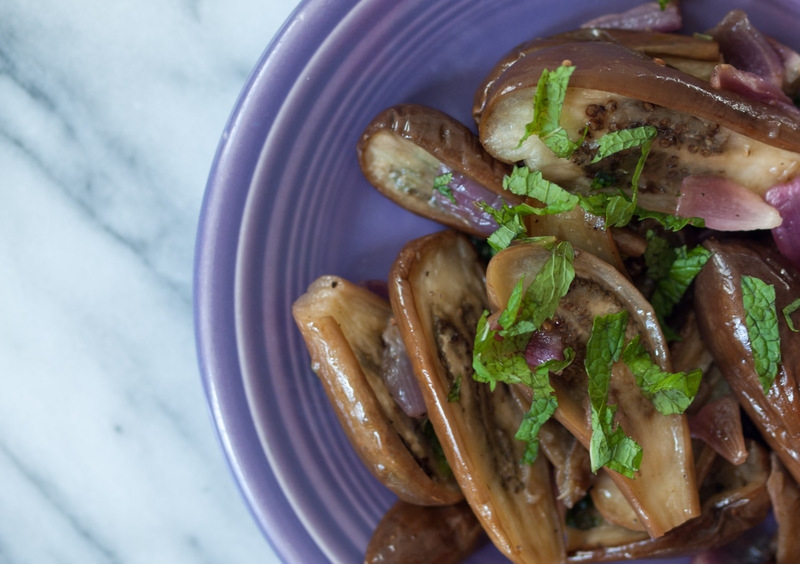 Sprinkle eggplant slices with salt and let sit for a few minutes (not necessary if eggplant is super fresh). 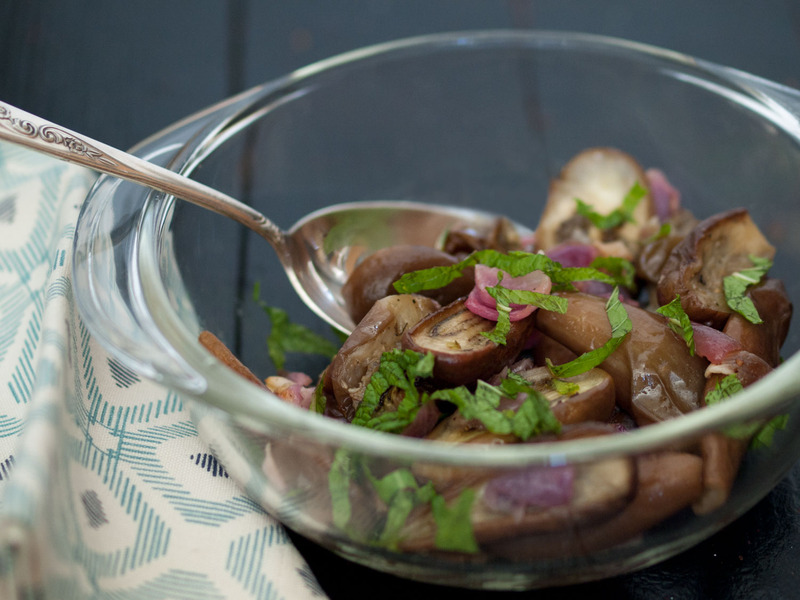 In a baking dish, toss eggplant with onion, a bit of olive oil, and some salt and pepper. 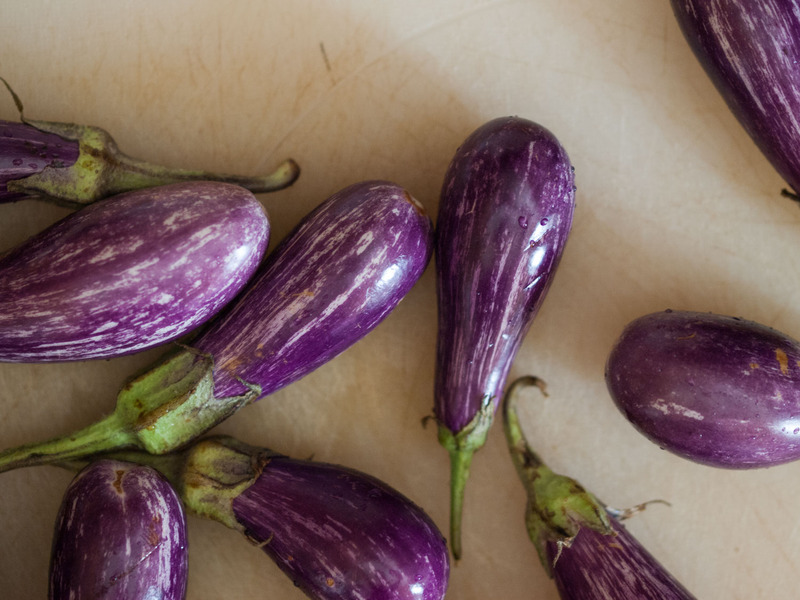 Roast in oven for about 30 minutes, stirring once or twice, until eggplant is very tender. Remove from oven and season with fresh lemon juice. Just before serving, garnish with fresh mint. This entry was posted in Sides and tagged gluten-free, Vegan MoFo on September 2, 2014 by Sarah.